The first burger to be made from quality assured Real Galloway Beef launched in Aldi stores across Scotland this weekend. The Galloway Cattle Society has supported the creation of the Galloway Gourmet Burger as part of a project to make Galloway beef more identifiable and more accessible. 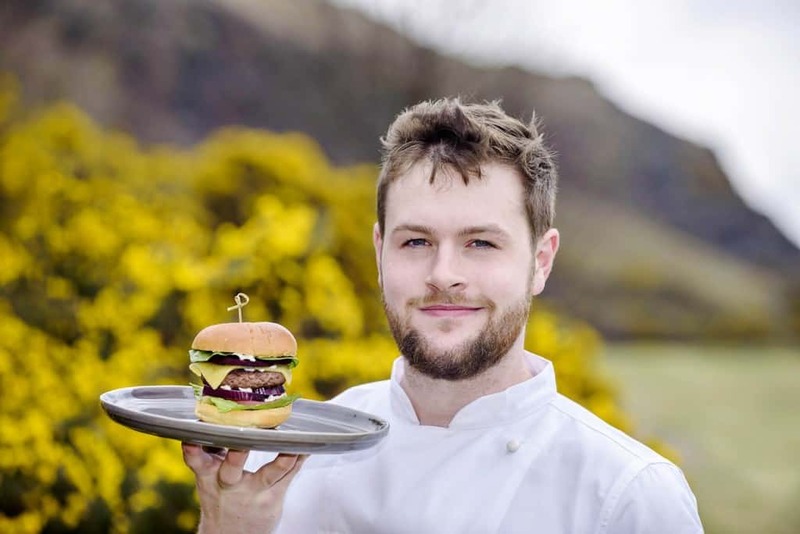 The burger was unveiled by the new Chef Ambassador for Real Galloway Beef, Fraser Cameron. The 21 year old chef is originally from St John’s Town of Dalry in Galloway and is now based in Edinburgh. Fraser recently won bronze in the Scottish Young Chef of the Year championships, was a Scottish Food & Drink Fortnight Young Ambassador and was one of three young people to go on a Galloway Beef learning journey to Australia last year. He is passionate about the quality and flavour of Galloway beef and will work with the Galloway Cattle Society to promote Real Galloway Beef through recipe ideas and serving suggestions. His first recipe focuses on the Galloway Gourmet Burger. “Galloway beef is an exceptional meat with a full, rich flavour. The burger is a really easy and convenient way for people to try Galloway beef for the first time and it’s great to see my local native cattle breed being showcased by a major retailer in this way. “I’m thrilled to be the Chef Ambassador for Real Galloway Beef because I think it’s a meat that should be much better known than it is. It has everything going for it in terms of flavour and texture, and being one of Scotland’s most ancient native cattle it’s one of our most sustainable beef breeds too. “An important part of our LEADER funded ‘Defining Galloway Beef’ project is about working with the retail and hospitality industry to make Galloway beef more accessible for people to buy. We first approached Aldi about the possibility of a Galloway beef retail product at the Royal Highland Show last year and we are very pleased that they are supporting the breed by creating this gourmet burger. The Galloway is one of the oldest and purest of Scotland’s native cattle breeds and beef from Galloways has distinct properties, including intra-muscular fat marbling through the meat and a balance of omega oils that is similar to salmon. Galloway Beef is widely considered to be a premium meat, yet at present it rarely commands a premium price at the farm gate. The Real Galloway Beef quality assurance scheme was launched by Fergus Ewing, Cabinet Secretary for the Rural Economy and Connectivity, at the Royal Highland Show last year. The standards note that cattle sold under the ‘Real Galloway Beef’ brand must have at least one parent registered with the Galloway Cattle Society, should be primarily grass fed and reared outside. The Galloway Gourmet Burger will be in Aldi stores across Scotland now and costs £2.19 for a pack of two burgers. Fraser’s Galloway Gourmet Burger recipe is on www.gallowaybeef.co.uk . Food and hospitality businesses interested in working with the Galloway Cattle Society should contact Dorothy Goldie on info@gallowaycattlesociety.co.uk .